Arkansas added the 18th most solar projects among the 50 states last year, adding 118 megawatts of solar generation, according to GMT Research and the Solar Energy Industries Association's latest market report. Nationwide, the number of solar projects was up a modest 2 percent, but the market has been surging in early 2019. "Solar is an increasingly important economic driver for the state's economy," said Katie Niebaum, executive director of the Arkansas Advanced Energy Association. Demand for solar power and other advanced energy technologies continues to grow rapidly, she told Arkansas Business. "Advanced energy companies are investing in local communities and creating jobs to meet that demand." Beyond the 2018 numbers, the market seems poised for a surge, said Abigail Ross Harper, the SEIA's president and CEO. "The solar industry experienced growing pains in 2018, in large part due to the unnecessary tariffs that were imposed on solar cells and modules, but this report still finds significant reason for optimism," she said in a statement. "The total amount of solar installed in America is on track to more than double in the next five years … It's clear, this next decade is going to be one of significant growth." AAEA members leading the solar market include Arkansas Energy Ventures, Dadeni Solar, Delta SunEnergy, Entegrity, LightWave Solar, Ouachita Electric Cooperative Corp, Picasolar, Scenic Hill Solar, Seal Energy Solutions, Shine Solar, Silicon Ranch Corp., Solar & Renewable Power Systems, Sun City Solar Energy, The Stitt Group, Today's Power and Trem Wel Energy, Niebaum said. She added that optimism is growing locally with the passage of Senate Bill 145, which will allow third-party leasing of solar equipment under the state's net metering program, letting homeowners, businesses and nonprofits partner with solar companies in arrays that could significantly cut energy bills. The SEIA report found that through the end of 2018, Arkansas had 1490 megawatts of solar power installed, though that amounts to only 0.34 percent of the state's electricity total, enough to power about 17,000 homes. The trade group found that Arkansas has seven solar manufacturing companies, 18 installers/developers, and nine other related businesses. The total solar investment in the state was put at $181 million. "States with third-party leasing have two or more times the number of solar jobs than states without," said the Bowen report, called "2019 Snapshot of Findings: Potential Effects of Third-Party Solar Leasing in Arkansas." "Solar panels are a public witness to our belief in renewable energy and a way to offset some long-term energy costs, while continuing our church's identity as a leader in the field of environmental stewardship," said the Rev. Stave Hancock, senior pastor. Other worship sites with solar installations in Arkansas include St. Mark's Episcopal Church, Little Rock; St. Margaret's Episcopal Church, Little Rock; Grace Community United Methodist Church, Fort Smith; Unitarian Universalist Fellowship, Mountain Home; First Presbyterian Church, Fayetteville; Good Shepherd Lutheran Church, Fayetteville; Omni Center for Peace, Justice and Ecology, Fayetteville; Ferncliff Presbyterian Camp and Conference Center, Little Rock. 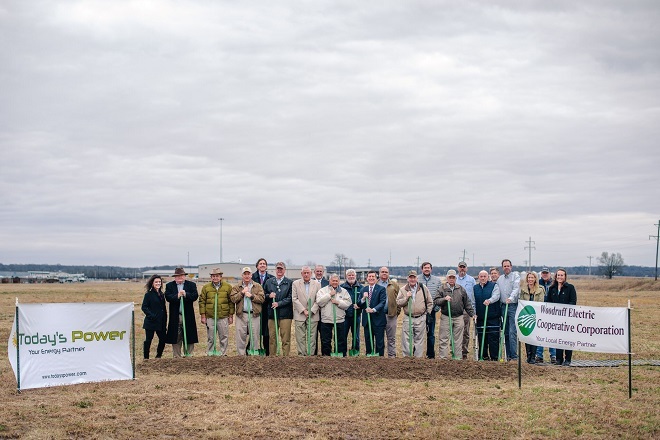 Woodruff Electric board members, leadership and employee and Today's Power executives break ground on a 1-megawatt array in Forrest City.